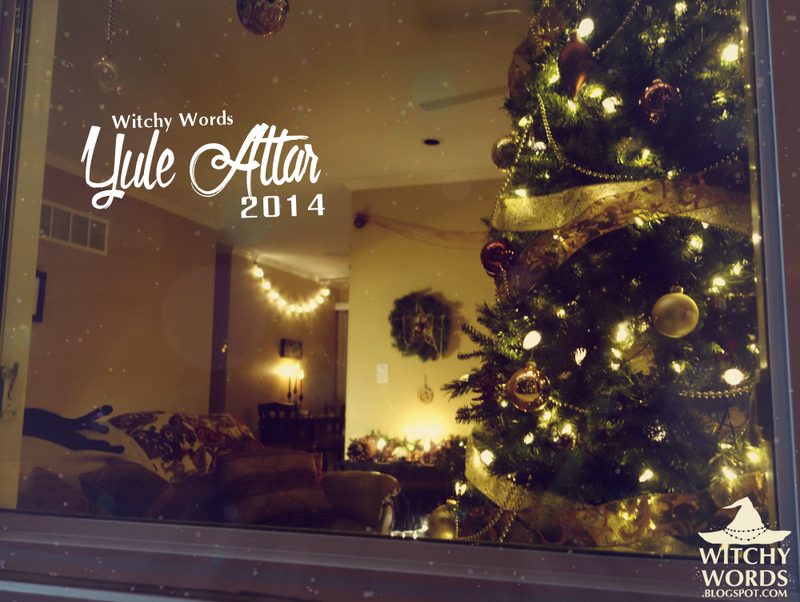 To see 2012's Yule / Midwinter / Winter Solstice altar, click here! 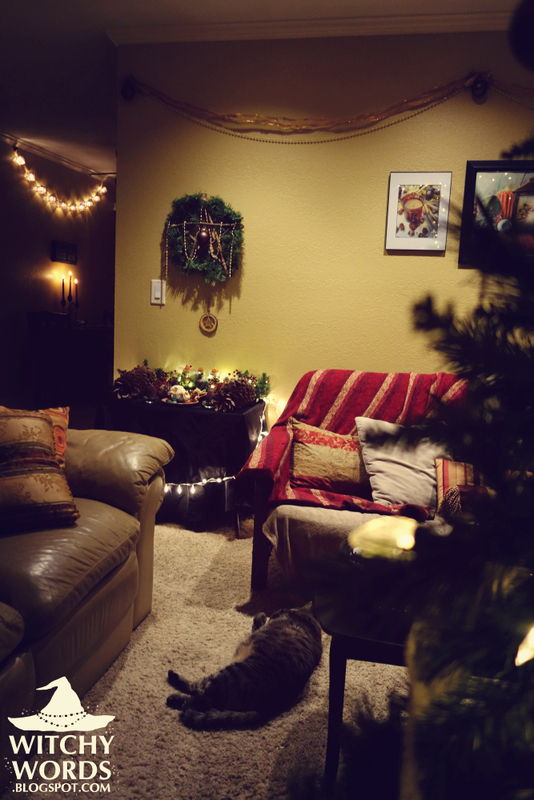 One of my familiars Zeus is incredibly relaxed in our festive Yule abode. Yule is the sabbat of darkness transforming into light, this solstice marks the longest night of the year. After the 21st, the nights will slowly shorten, the days lengthening in preparation for warmth, planting and renewal. 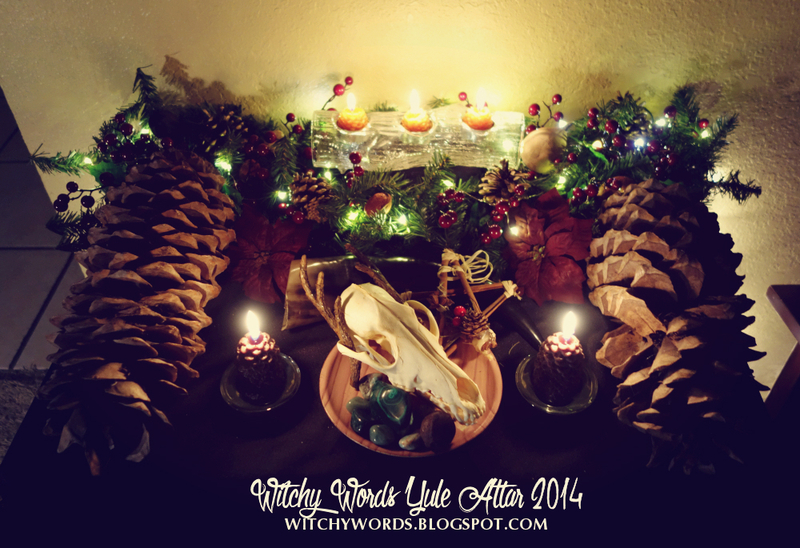 The items on my altar reflect the meaning behind Yule. 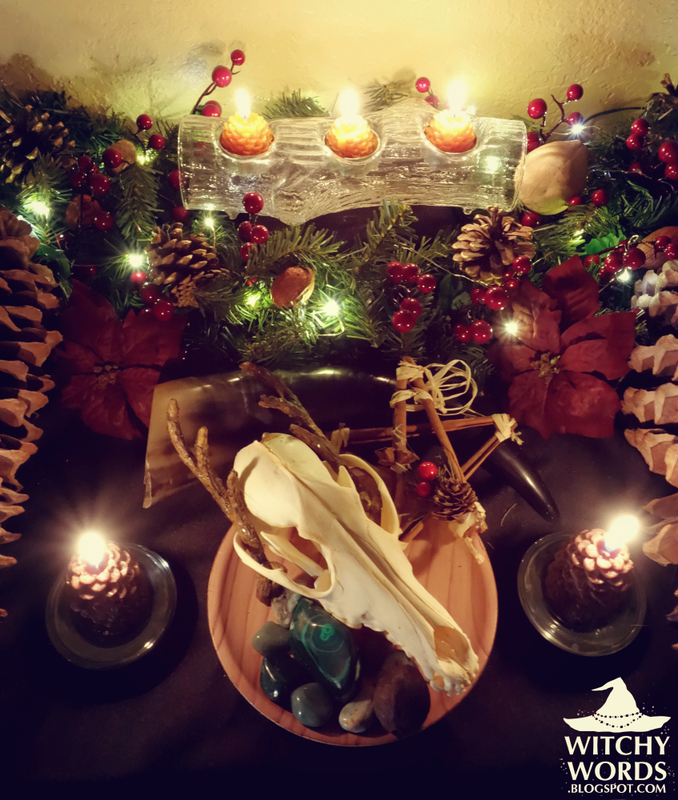 I used a variety of seasonal decorations to represent the many faucets of the sabbat, including transformation, the cyclical nature of life and death, the coming light, and the prosperity and happiness felt in the warmth of friends and family. The altar itself is pine themed. 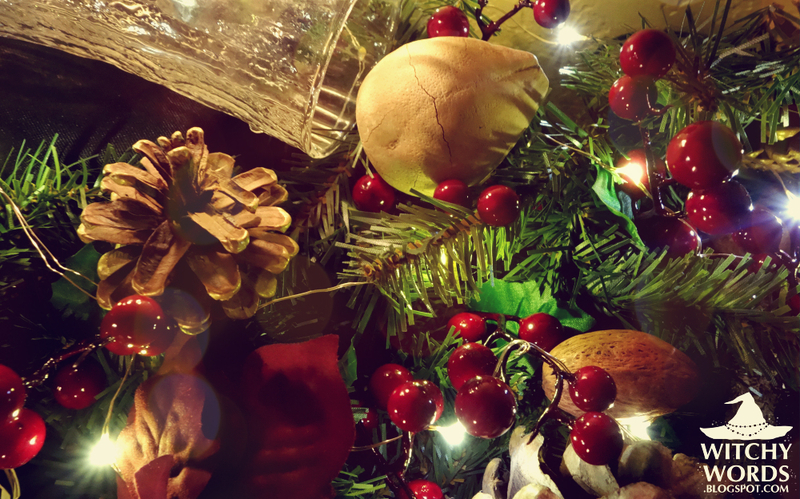 Pine trees and cones are particularly relevant to the holiday as we often bring them in for decoration. Pine trees are evergreens, and thus stay green throughout the cold winter months. Decorating them hearkens the concept of spring, which is just around the corner. 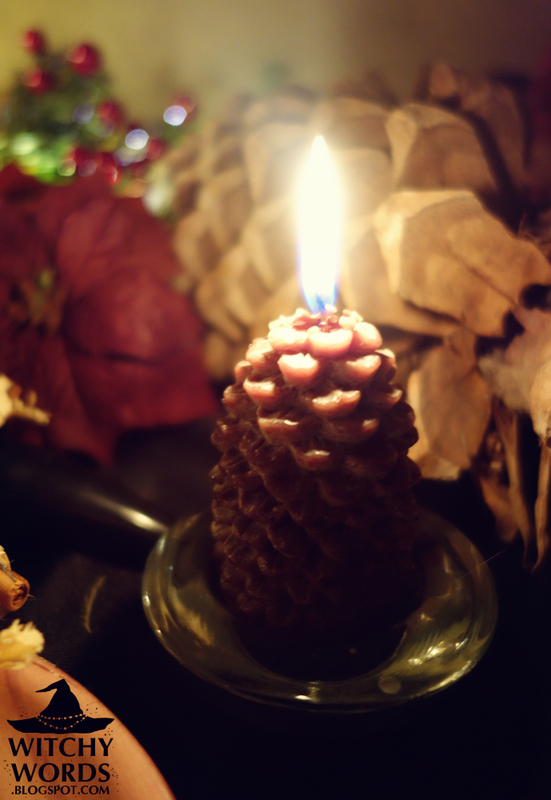 Pine cones themselves have often been associated with Dionysus, and represent fertility and potential. For some, this holiday is the birth of the Horned God. For others, this sabbat represents the transition coming from the non-planting months to the planting months. Either way, we look forward to the fertile months we hope are ahead. 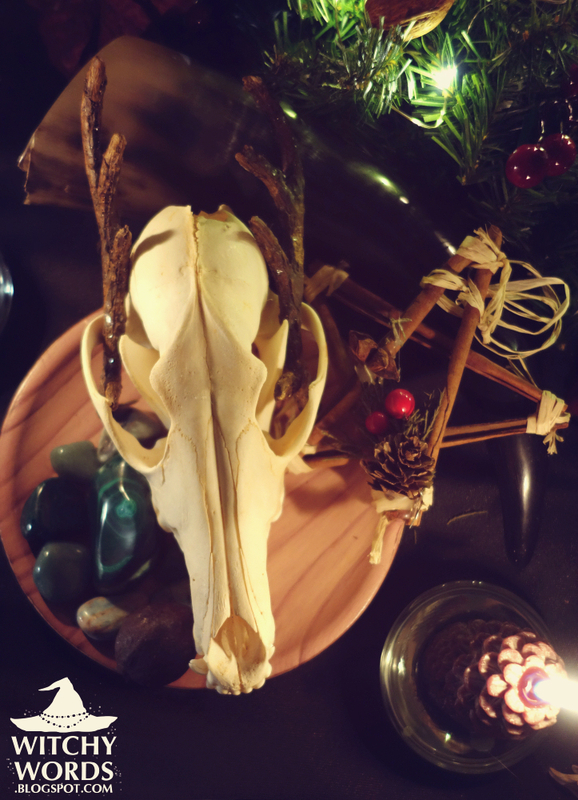 The central focus of my altar is a coyote skull adorned with branches fashioned to look like deer antlers and lined at top with a polished ram's horn upon a wood plate of malachite, rainbow fluorite and green aventurine. Coyotes represent instinctual resourcefulness - the ability to survive under the worst conditions. They are also beings of change and transformation. However, when working with coyote symbolism, have caution. They're known for being masters of trickery and humor that you may not fight that funny yourself. Deer represent fertility and regrowth. The primary function of antlers is to enhance the chance of finding a mate, thus fertility. Antlers are often shed and regrown each year, thus regrowth. In many legends, a deer also represents the soul or spirit, or has a strong connection to the spiritual world. Rams are signs of masculine, erratic energy. Because this sabbat represents the rebirth of the sun, or perhaps the Horned God, this holiday can often be seen as very masculine. The ram's horn on the altar pulls that masculine energy. 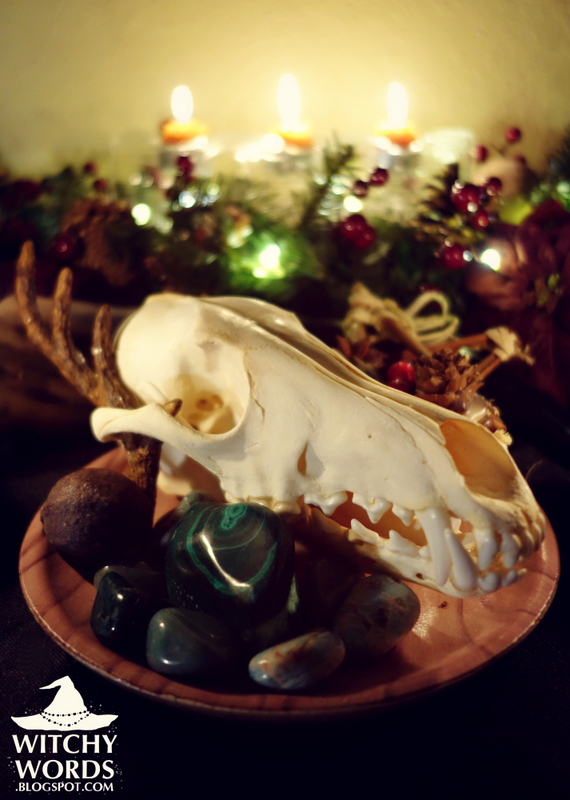 The combination of stones next to the coyote skull are particularly relevant for the Winter Solstice. 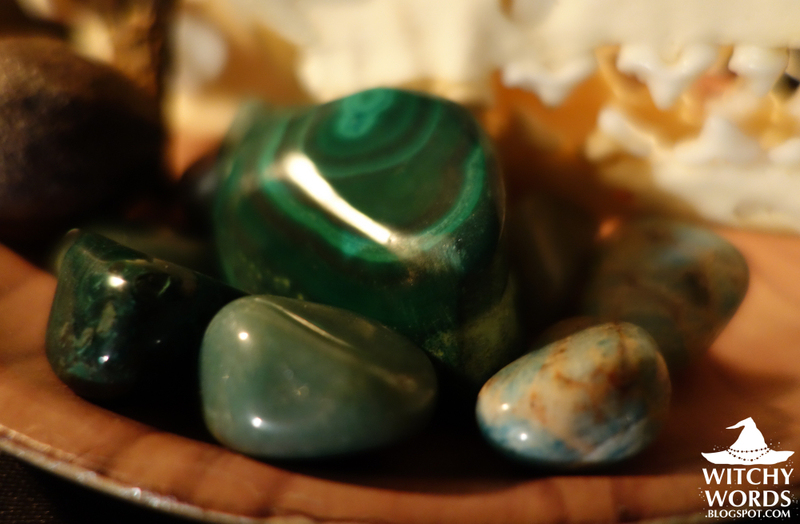 Malachite is a very earthy stone representing transformation. This transformation can be seen as we move from dark to light. Rainbow fluorite is a stone of balance, something we all need during this hectic holiday season as we're often visiting family and friends, balancing work and parties and trying to maintain our personal lives. Finally, green aventurine is a stone of prosperity, something we look forward to as the light returns. The final item on the plate is a pentagram made of cinnamon sticks. The pentagram is a protective symbol and cinnamon is a protective herb. 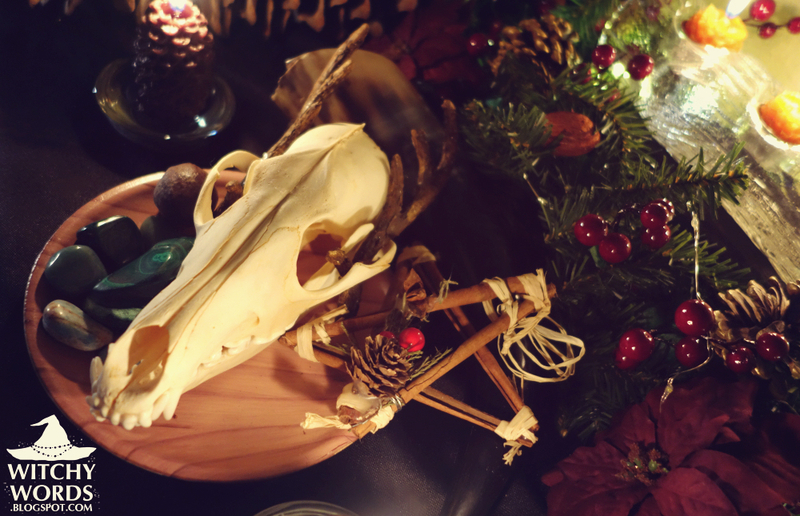 The two combined make this a powerful warding force and, laid upon the bones on the table, protect against the energies I may not want those animals to bring to the house. At the top of the altar, I've placed pine garland (faux and flame-resistant just in case of accidents), decorated with holly, pine cones, dried nuts and pears, and topped with sparkling dew drop lights. Holly is a winter berry that offers love and protection, and represents the cycle of life, death and rebirth - particularly relevant on a holiday that represents rebirth. Pears are representative of immortality and fertility - the immortality of the sun and the fertility of the earth, or perhaps the immortality of the Horned God and the fertility of the Goddess in her Mother form. The nuts are seasonal and they too represent fruitfulness and fertility. Poinsettias also adorn this altar. 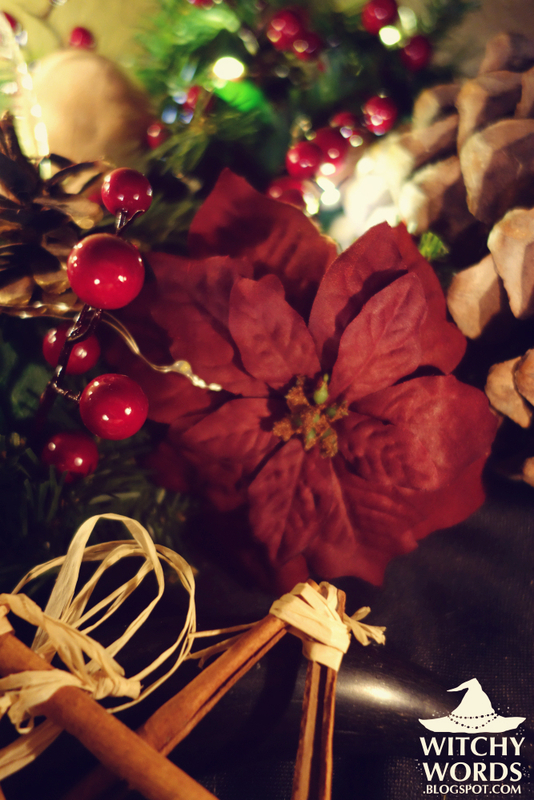 A common gift during the holidays rising from Mexico, poinsettias represent happiness, purity and success. It is said that gifting someone with a poinsettia plant will offer these traits to them in the new year. Keep in mind that real poinsettias are poisonous, so if you have small children or pets, take caution. The poinsettia flowers you see on my altar are fake because of my four familiars. 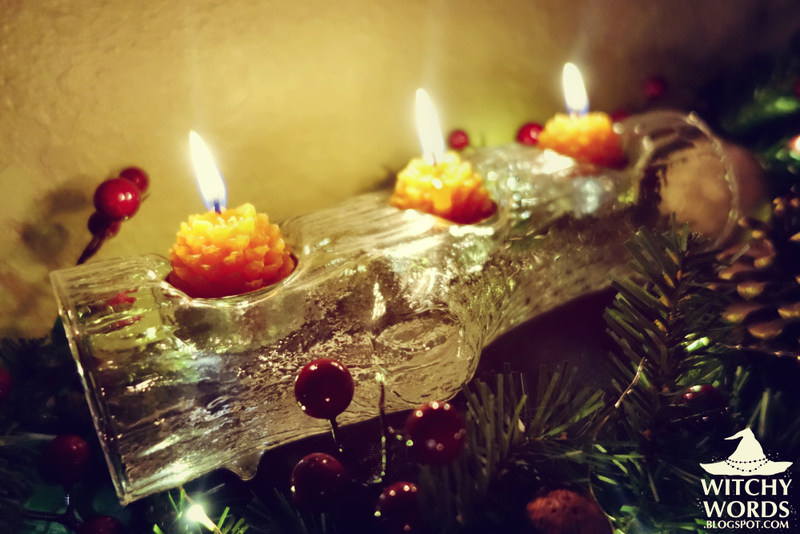 Perhaps my favorite part of this altar is the glass Yule log I found at a thrift store, complete with three pine cone tea lights, for a mere $5 a few years ago. I absolutely love this, especially since we are no longer renting a house with a real fireplace. Yule logs are a tradition for the solstice that offers protection and prosperity when burned. Often, you start this year's Yule log in the ashes of last year's to represent the cyclical nature of the year. Over the altar hangs my pentacle wreath, as shown in my post about our Yule decorations for the year, as well as a new ornament I found at Target for just $3. 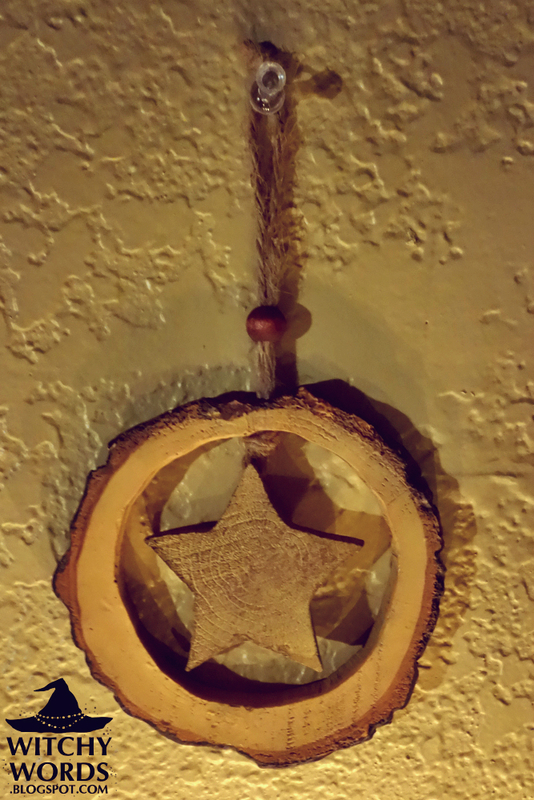 It's heavy and made of wood and absolutely perfect for that space just below the wreath! 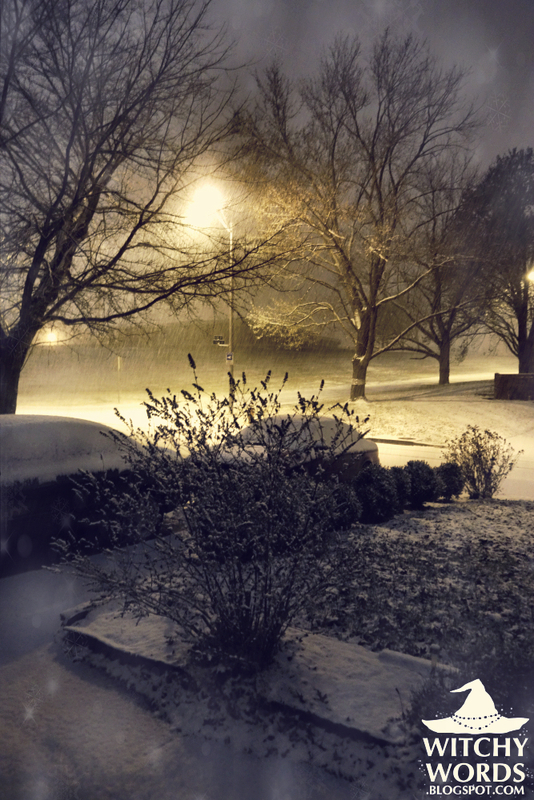 As I began piecing together my altar tonight and taking photos, Kansas City received its first real snow of the year! This picture may not show much, but we ended up receiving a hefty amount that resulted in school closures today. It's absolutely gorgeous outside! 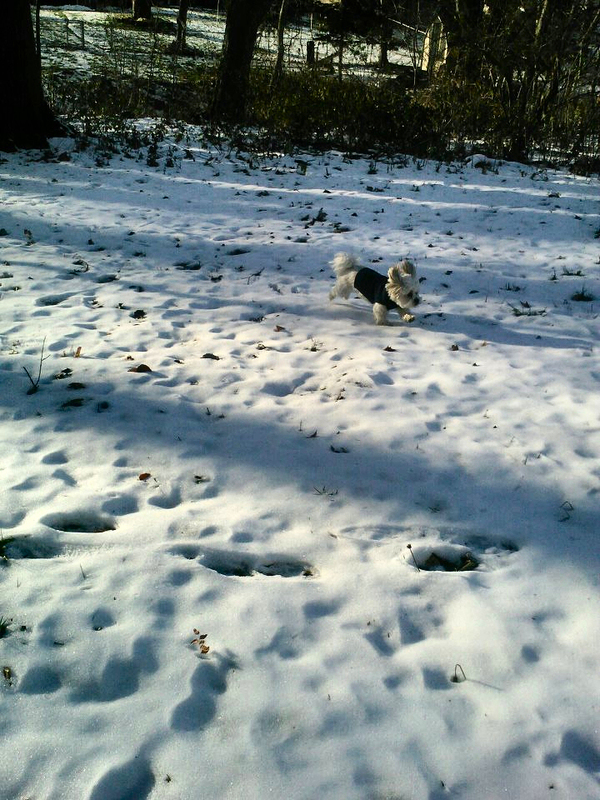 I can't wait to take my Artemis out - that dog absolutely loves the snow. 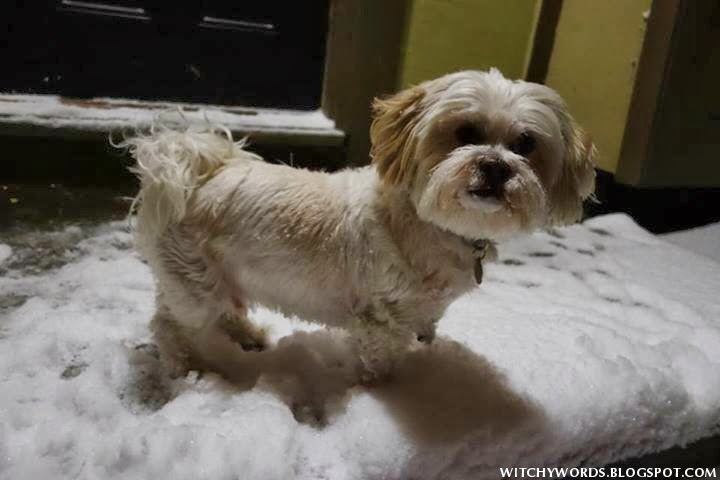 Have a happy and festive Winter Solstice! 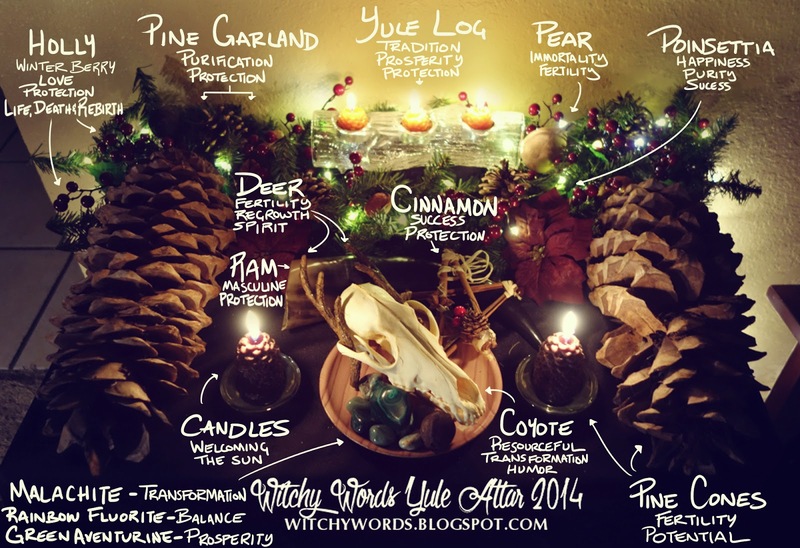 Coming soon: Liithi Lushede's public Yule ritual, and Circle of Fountain's Yule celebration and my holiday cards and infographic for 2014! Love your altar. Very beautiful!